At Adams Patterson, we do not offer treatments with CoolSculpting®. We are focused on providing the best-available products and technology to our patients, while saving you money, time, and maximizing your results. Because SculpSure™ typically requires only one treatment per area and requires half the time as CoolSculpting®, it saves our patients time and makes their fat loss more efficient. 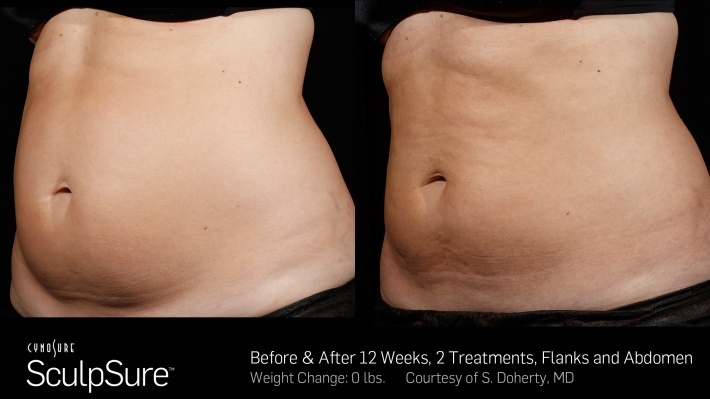 When you're ready to make the decision to have excess portions of fat removed from your body, we hope you consider SculpSure™ treatments from the board certified physicians at Adams Patterson. Contact us today to discuss your SculpSure questions and how it can help you love the way you look! See the results in this before and after picture.